Yao Ming launches his own California wine label. Slam dunk! So, retired basketball star Yao Ming is launching his own California wine label. Yao Family Wines is a bit different from other sports figures’ vanity wines in that it is being targeted primarily for the Chinese market. 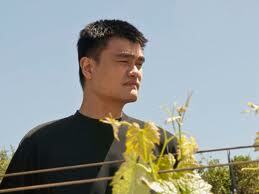 The sole wine released so far, the 2009 Yao Ming Napa Valley Cabernet Sauvignon, will retail for $289 per bottle. The debut release consists of 5,000 cases, according to Wine Spectator, and a second 500-case limited release, Yao Family Reserve, is scheduled for early next year. Yao’s approach is a bit different. He has tapped Tom Hinde to run the business. Hinde is an experienced hand in wine — he was general manager of Kendall-Jackson Wine Estates through the ’90s and then president of Flowers Vineyard — but not necessarily a familiar one for the Napa realm. As for a stately winery facility, manicured hillside vineyards, marble and fountains? Nope. They say they hope to buy property at a later date.